Sleeve notes in English and Finnish. Vocal Symphony libretto text in original German and in English translation. 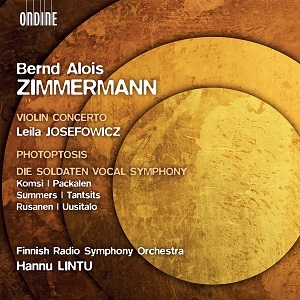 This new release by the award-winning Finnish Radio Symphony Orchestra conducted by Hannu Lintu is dedicated to the music of Bernd Alois Zimmermann (1918–1970), a leading figure in the music of post-Second World War Germany. This album includes a rendering of the composer’s magnificent violin concerto featuring star violinist Leila Josefowicz, orchestral score Photoptosis, as well as the first CD recording of Die Soldaten Vocal Symphony based on an opera that is widely considered as one of the greatest German operas of the 20th century. Zimmermann wrote his Die Soldaten opera, one of his keyworks, during the 1950s and 60s. The premiere of the opera was cancelled, and upon hearing the claim that the opera would be ‘impossible’ to perform, the composer adapted parts of the opera into a 40-minute vocal symphony suitable for concert performance. This work, filled with power and drama, is much more than a description of the apocalypse of modern war, and deserves its rightful place alongside the operas of Alban Berg. Zimmerman’s Violin Concerto is a relatively early work in the composer’s oeuvre. It was premiered in 1950 but has suffered much neglect. The influence of Schoenberg, Hindemith, Bartók, Stravinsky and Prokofiev are visible in this work which we might consider to manifest echoes of war. Photoptosis (1968), ‘Incidence of Light’, is among Zimmermann’s final orchestral pieces. Inspired by a painting created by Yves Klein for the Gelsenkirchen music theatre, this work includes quotations by Scriabin, Beethoven, Bach, and Wagner, among others. Yet, this “Prélude”, as described by the composer, is not a collage, but a study in orchestral sonority and light. Conductor Hannu Lintu recently won the Gramophone Award for his recording of the Bartók Violin Concertos (ODE 1317-2) together with Christian Tetzlaff and the Finnish Radio Symphony Orchestra. Recordings by the Finnish Radio Symphony Orchestra under Hannu Lintu on Ondine have gathered excellent reviews in the international press. Two of their recordings were nominated for Gramophone Awards in 2018. One of them, including orchestral works and songs by Jean Sibelius (ODE 1289-5) also won an ICMA Award in January 2018.